So you want to show your latests Twitter updates in your web page? 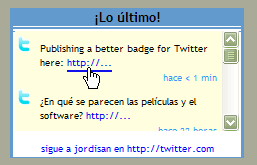 You can use Twitter’s badge, but the look isn’t great, and URLs neither @replies inside updates are not clickable. You can modify the css file to get the appearance you want. You can also modify some strings in the .js file (for instance to adapt them to your language). Don’t forget including your own Twitter username. You can also modify the ‘loading…’ or the ‘follow me’ strings. Don’t forget including your own Twitter username. You can also modify the number of updates to show. Please tell me if you are using this badge, or you find any error or upgrade. jordisan is an Information Systems Engineer and Master in HCI who tries to develop his work in border areas between human and computers, and between research and professional projects. This is a “botijo”, a Spanish version of the famous teapot from Don Norman’s book “The Design of Everyday Things“. But, like Norman’s teapot, it’s not an usual “botijo”; can you tell why?